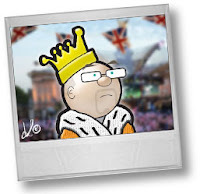 I wasn't too bothered about the up and coming Diamond Jubilee celebrations at least until the event came along. We didn't attend any events (mainly because there was very little locally). I did find myself being carried forward with the wave of patriotism and national pride, hey they even gave me a medal. good one on the medal - what was it for? All military and Police received one.